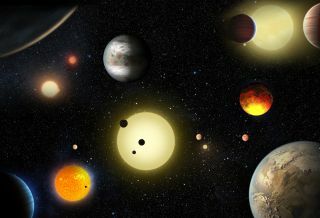 NASA's Kepler space telescope has discovered thousands of planets orbiting distant stars. The briefing will be at 11 a.m. EDT (1500 GMT) during the Kepler Science Conference at NASA's Ames Research Center in California. You can watch the exoplanet announcement here, courtesy of NASA TV. NASA will livestream the conference here: http://www.nasa.gov/live. Kepler has been hunting for extrasolar planets since its launch in 2009. This latest set of exoplanet candidates will use a more complete data set than ever before, with analysis of greater sophistication. The spacecraft started a new mission, called K2, after the failure of two reaction wheels that stabilized the spacecraft in 2013. The K2 mission was a modified version of the original planet-hunting mandate, seeking worlds around relatively nearby red dwarf stars. Newfound exoplanets are often listed as candidates because it can take time to verify that they are actually there. Kepler finds planets by observing the light of stars over a period of time, using a process called the transit method. If the light dims, then it's possible a planet passed in front of it. The evidence for an exoplanet is considered stronger if the light dims more than once on a predictable schedule, indicating that something is in orbit around the star. Kepler was the first mission capable of seeing planets the size of Earth around other stars in the "habitable zone" — the region at a distance from a star where liquid water could exist without freezing or boiling away immediately. According to NASA, thus far Kepler has found 4,496 exoplanet candidates. Some 2,335 have been confirmed and 21 are Earth-size planets in the habitable zone. Since the mission was renamed K2, an additional 520 exoplanet candidates have been found, with 148 confirmed.